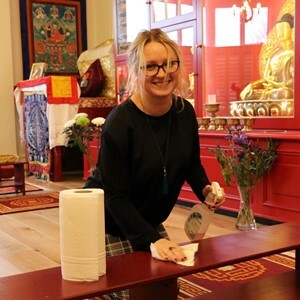 Kagyu Ling Buddhist Centre relies on volunteers to maintain its building and garden. Help is always welcome and can be a great opportunity to meet other members of our community from around the north west. Whatever your skills and however much time you can spare there is a job to suit you. We are always keen to welcome cleaners, gardeners, cooks and DIYers. Please contact the centre co-ordinators if you’d like to offer to help. More information about Kagyu Ling Buddhist Centre.